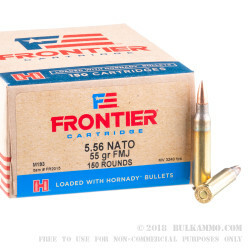 Hornady offers their accessible line of Frontier ammunition for plinking, training, and target shooting where great performance is welcome but dropping huge wads of cash in exchange for it isn’t. State of the art loading techniques and strenuous quality assurance go into each and every round, which combined with Hornady’s long-standing reputation for quality means you can’t go wrong investing in Frontier. 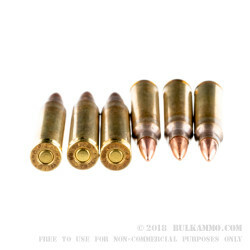 This 5.56x45mm cartridge features the M193’s 55 grain bullet, which is an extremely common weight for its caliber. 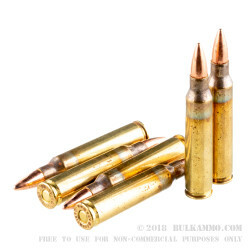 The bullet penetrates targets marvelously thanks to the gilded metal jacket around its lead alloy core, which also suits it for extended shooting sessions because it won’t needlessly foul your rifle’s bore with lead residue. 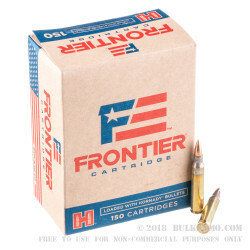 This cartridge additionally features a factory fresh brass casing and military grade Boxer primer and propellant, making it not only extremely reliable but also fit for handloading. Try these 1,200 rounds and see why Hornady’s lofty manufacturing standards have made them a popular go-to among all types of American shooting enthusiasts.